Buffalo wings were the most Googled Super Bowl food in New Jersey leading up to last year’s game. Buffalo chicken dip was the number one searched item in Pennsylvania. No Super Bowl party is complete without a table full of touchdown snacks. With all the inevitable anxious pacing back and forth, screaming bouts at the refs, and, of course, jumps for joy each time the Eagles score, game-day fuel is a necessity. Which foods are a must for your spirited celebration? Buffalo chicken dip was the No. 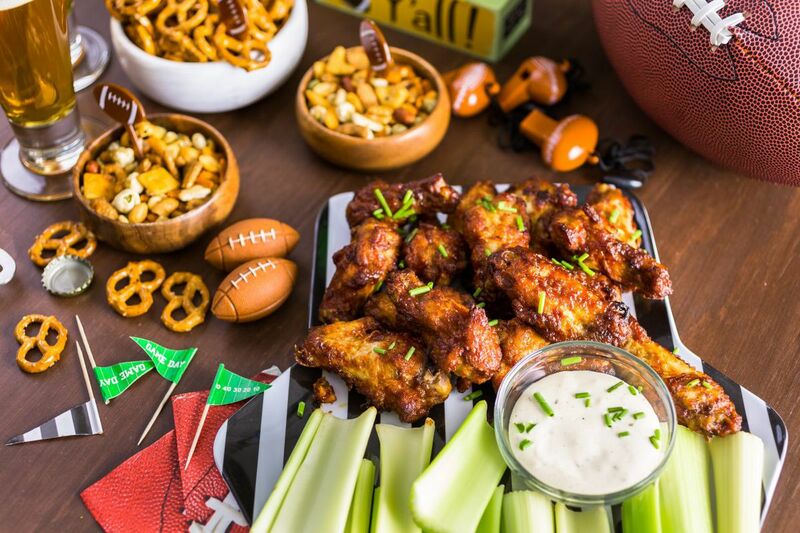 1 most-googled Super Bowl food in Pennsylvania leading up to last year's game, according to Google Trends; Buffalo wings were tops in New Jersey. Given the two dishes' popularity, there's no doubt each should be included in this year's party spread. "People want finger foods during the Super Bowl so that there's no need to sit down in a dining room and miss any of the game," said Michael Strauss, co-owner of Taproom on 19th and owner and executive chef at recently opened Mike's BBQ. Strauss provided us with his rendition of Buffalo chicken dip, which includes a special secret ingredient — thinly sliced pepperoni to add an extra-crunchy punch on top. "I'm a fan of anything you stick a nacho chip in, and I believe most people feel the same," said Strauss, who will watch the Super Bowl with his staff at Mike's BBQ after closing up shop just before kickoff. To source a recipe for New Jersey's favorite Super Bowl food, we turned to the owner of Hammonton's Henri's Hotts BBQ, Douglas Henri, who seems to keep a continuous flow of wings in the fryer, whether at his restaurant or at his house. "I have the Buffalo recipe memorized because I make it so much," Henri said. "We make them at the house almost every other week during football season, and while we try to eat healthy, we often have some sort of fried chicken at the dinner table." Henri also cooks up honey-, honey-garlic- and jerk-style wings, but it's the Buffalo variety that remains the most popular and his personal favorite. He kicks up his Frank's RedHot-based sauce with an extra dash of cayenne, and invites fellow spice-lovers to do the same.